An "informal notice" may be sent to a tenant at any time. An "informal notice" is a notice that you WILL NOT use as a basis to evict a tenant or to terminate tenancy. Examples of "informal notices" include: a notice that the tenant sent the rent check to the wrong address last month, a notice that the tenant is not keeping the grass properly watered, or a reminder that parking is assigned and the tenant is parking in the wrong assigned parking space. A "formal notice," on the other hand, is a prerequisite to an eviction action. "Formal notices" include: a 5-Day Notice to Pay or Quit (for nonpayment of rent), a 10-Day Notice for Material Noncompliance, or a 5-Day Notice of a Noncompliance Materially Affecting Healthy & Safety. A "formal notice" MUST be served upon the tenant before the landlord files an eviction action in court (called a special detainer action for residential tenants). So, when can the landlord serve a formal notice? As soon as the default has occurred. For nonpayment of rent, assuming rent is due on the first day of the month, then the 5-Day Notice to Pay or Quit may be served on the second day of the month because rent is delinquent on the second day of the month. And this is true without regard to when (or if) late charges begin to accrue. For a non-monetary default, such as a 10-Day Notice of Material Noncompliance (i.e., for unauthorized pets, unauthorized guests, noise, etc. ), the notice may be served on the same day the default occurs. You may also serve the notice "sometime after" the default has occurred, but a delay of more than a couple days (other than for nonpayment) may cause some judges to conclude that the default was not that significant if failed to act promptly. We have been renting to a friend for a few months on a month-to-month verbal agreement. Last month we gave her a 30 day notice to move-out due to animal cruelty, and she said she would be out by yesterday (10/31/2012). However she is not out and she has left her stuff behind, nor have we heard anything from her for about 2 weeks or so. Today we left a notice of abandonment from your website (thank you). Is this the proper way to go? We have her parents address we are going to take a copy to and have them sign it (or at least deliver). Thanks in advance for your advice. Response by Carlton C. Casler: You need to post a copy of the abandonment notice on the front door (or front entrance) AND send a copy via certified mail to ALL known addresses for the tenant. You may ALSO hand-deliver the notices; if they sign for it – fine, if not – that’s okay, too. There is no requirement that the recipient (i.e., friend or relative) sign for a hand-delivered notice. Move and store her personal property at a different location and send (via certified mail) an inventory list and the cost of moving and storage to the tenant’s address(es). The LL/T Act allows you to store the personal property inside the rental. Tenants frequently break in to their old rental property to recover some or all of their personal property, but very few will break into a storage unit or a different rental property. To recover her personal property, she only has to pay moving and storage; you CANNOT require her to pay any other amounts. You can file a lawsuit for any other amounts she owes you, but you can’t refuse to release her personal property until she pays any other amounts. I made a mistake and allowed a friend of two years to rent a room from me in Feb 2009. W had a verbal agreement. By June 2009 he owed me over $1,200 in rent and utilities. I then had him sign a month to month agreement and a promissory note on the balance owed for the period Feb to June 2009. He told me he had to go to California to take care of a sister. He has made three deposits into my account; a total of $ 600.00 over the past 90 days. He has made no attempt in the past 34 days, when he had told me that he would deposit $200 a week. Question: he hasnt given me any notice that he is moving; he only took his clothes but left bed, tv etc in the room. I have no known address for him to send him a notice, so I filled out abandonment form and also notice to repair for a damaged screen and also notice to pay or quit. With rent, utilities and late fees he owes me over $3,800. Should I mail them to the address of my condo where we lived together since I have no physical address for him? I planned on mailing the notices here and having them unopened with post marked date, showing I made effort to locate him and give him notice? Response by Carlton C. Casler: Long question, short answer -- Yes. If the only address the landlord has for the tenant, then the notice (whatever notice is required: 5-Day, 10-Day, Abandonment, etc.) must be sent to the "last known address," which will be the address of the rental property. Whether or not the statute requires certified mail, I recommend sending by certified mail so that you have proof of mailing and either proof of receipt or return of the original letter to you. Answer by Carlton Casler: Abandonment is not the right process. Abandonment applies when the tenant is absent and the landlord does not know where the tenant has gone; you know the tenant's location. 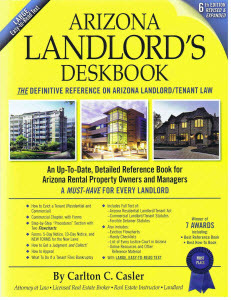 Serve a 5-Day Notice to Pay or Quit; serve it by mailing (certified mail, return receipt) a copy to the rental property, one to the jail and one to any other known address for the tenant (if any). If rent is not paid within five days (add another five days for service by certified mail), then file a "Special Detainer" action (i.e., an eviction action) in the local justice court.